Shrimp appetizers are always popular. If you choose a shrimp cocktail for instance, you can get it all ready beforehand, leaving you loads of time to get the main, sides and dessert ready. You can have hot or cold, mild or spicy. 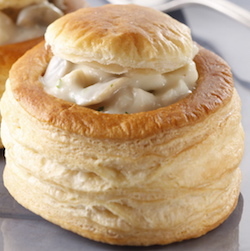 Serve the shrimp as finger food with crusty bread or a gentile spoon and fork with sliced brown bread and butter. The classic shrimp cocktail is one of the most popular appetizers. In the cool 1970s, everybody's favourite three course meal was shrimp cocktail, steak and chips and Black Forest Gateau. This serving dish is an original 1970s one that I personally own - very retro! and a little trip down memory lane for me. You can make it more up to date - people like to serve in teacups and saucers which looks very chic and elegant on the dinner table. The portion size is just right too, without overwhelming people for their next course. Of course, you can just as easily serve this as a main dish, add some more salad veggies and either boiled new potatoes or crusty bread and butter. 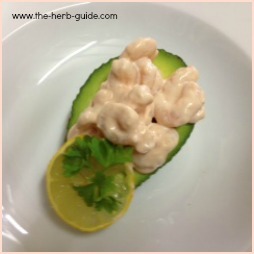 Another blast from the past with a Shrimp Avocado recipe. Super elegant again, easy to make in advance (sprinkle the cut avocado with lemon juice to prevent it going brown) and serve with some sliced brown bread and butter. One slice per portion is plenty if you're going to have two or more courses. 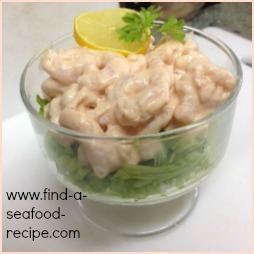 The Seafood Newburg recipe is one that you can adapt - the traditional recipe calls for shrimp, lobster and scallops, but I frequently make this with shrimp alone. It is an appetizer you can make well in advance - leave them covered somewhere cool until you're ready to serve. One or two per portion, depending on their size. I also like to serve these as part of a buffet - they're always very popular. A puree (puri) is an Indian flatbread which you fry and it puffs up. 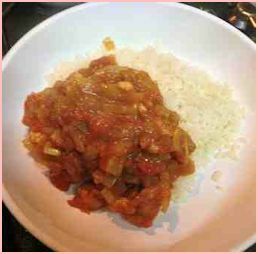 Make a basic shrimp curry (like the one in the photo above) and serve a couple of tablespoons on each flatbread. Garnish with some lemon wedges, sliced cucumber (2 or 3 slices) a couple of tomato wedges and some diced onion mixed with chopped mint if you like. These are one of my favourite Indian appetizers - it's the one I normally choose when I go out and I judge most restaurants by the quality of their Shrimp Puri! 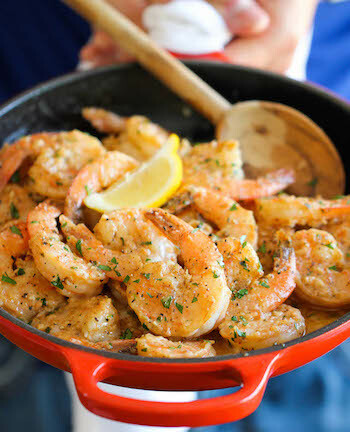 This lovely garlic and buttery shrimp appetizer is from DamnDelicious. There are step by step photos for you to follow along. It's super quick so although it's served hot, you can have it on the table in a few minutes. Put out some finger bowls - warm water with a couple of lemon slices - so that people can clean off their hands afterwards - mopping up the juices with warm, crusty bread is part of the pleasure of this and garlicky hands are not nice. Well, they are actually, but picking up your wine glass and leaving greasy fingerprints all over it, isn't!